Ever had one of those weekends when you thought you would do “this” and you ended up doing “that”. It happens plenty of times at our place. My son and I were going to do some concreting first thing – cement in some posts for an outdoor gym he was creating. Craig, my husband, was away with work and my other son is at uni, so that just left the two of us. To help you understand my day I need to explain that a few years back we helped to form a community not-for-profit charity called the Maranoa Wildlife Caring & Education Centre and continue to support this group today. Their volunteer coordinator was way for a few days, so the phone was diverted to my number. First a call about a injured bird picked up along the highway about an hour from town, however I’ll come back to this one. 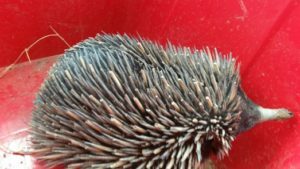 Next, a call about an echidna located in a garden in the town of Roma. 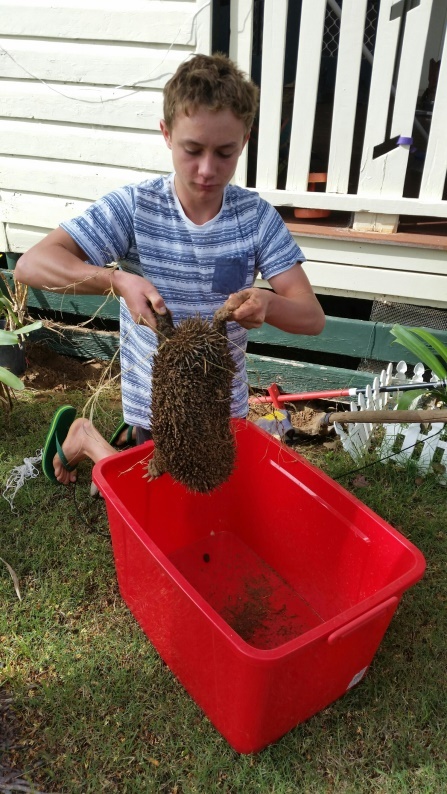 The owners had dogs, which they took around the back to keep them away for the echidna. Not liking all the attention the echidna had wedged itself in against the side of the house, dug down into the soil and curled up into a ball with his spikes out on all sides. Mitch (my son) and I were the only ones home; so we put a shovel, large plastic box and welding gloves in and off we went. He sure was wedged in and really didn’t want to come out. As we touched and tried to remove him, his natural reaction was to hunker down and dig himself in a bit further – not a bad defence mechanism when you don’t have speed on your side. Luckily he was in a garden bed, so the ground was a bit softer. I dug underneath the back of him with a shovel, enough to get my hand under quickly before he dug further in and we had to repeat the process again. Finally I was able to hold his back end up (with the welding glove on – too spikey to hold with a bare hand) and Mitch reached under and grabbed his back legs that were tucked well in underneath him. “Hold on and don’t let go” was all I said. Mitch was then able to outstretch his back legs and lift him out. They carry a bit a weight and are quite strong for a little thing. And because of the spikes, the best idea, if you ever find yourself in this situation, is to carry them out from your body. We put him into the plastic container and then took him home, before taking him out of town to a new location. Once we were home, a fellow turned up wanting to borrow the yards (cattle yards that is). Remember my story about the cattle on the stockroute. Well a cow and calf were left behind and they wanted to borrow our yards to then put them in a trailer and run them back up to their mates. So, we put the echidna (in the plastic box) in the office while I went and showed them the yards and helped them with the cow and calf. Between all this I had to duck back into town and meet the person who was bringing the injured bird picked up on the highway – the one I started this story with. 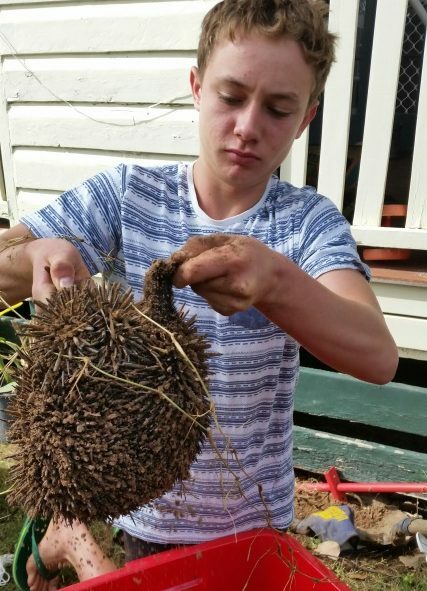 After all this, it was time to release the echidna. Went to get him and he was gone (did I forget to mention they are good climbers too? )….so a search of the office (it’s a large area) and we eventually found perched up on top of an old sewing machine box under a desk. Well, back into the plastic box and off to be released near a creek out of town. Driving along I could hear him climbing up the edge of box to try to escape again. There are plenty stories of echidnas wedging themselves in vehicles, however I will leave that for another time. That afternoon I decided instead to truck some weaner cattle back out to the farm. Maybe cementing tomorrow. By Meryl Eddie, Business Manager for Boobook Ecotours, Founder of MWCEC, Wildlife Warrior, Mum – Jack of All Trades really.